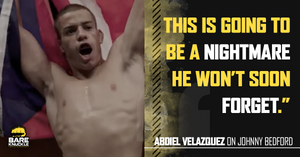 It took just 76-seconds for Velazquez to finish Shawn West at Bare Knuckle FC 3 in October 2018, the second fastest ending to a fight in the Florida native's combat sports career. Velazquez holds a 9-6 pro MMA record, one of those victories was a 67-second knockout win over Jaime Alvarez in 2015. Fast-forward four-years and Velazquez is presented with his toughest challenge to date, a veteran of six fights in the UFC's octagon, in "Brutal" Johnny Bedford. "I know that whoever wins this fight is going to get to the finals, and I give Johnny his respect, he's been in the game longer than me; he knows how to play the game, but this is bare knuckle," Velazquez said. "This is different. This is straight up hands, no MMA. I feel comfortable, I feel ready, I feel good. I'm natural with my hands so I know he is going to have some trouble with me. Bedford is a good guy, I respect him, it's going to be a great fight, but I feel like I am going to come out with the win and send him home." Velazquez is confident that his hand will be raised and he will move on in the competition. "I can see me getting a TKO over him in the second round," he said. "He's too good to get put down in the first. I'll put him away in the second." When it comes to pre-fight mental warfare, Velazquez isn't afraid to try and get in his opponent's head. "I got the 'Nightmare' nickname when I was competing in amateur MMA. I choked a guy out and he passed out. When he woke up, he looked at me and was like 'Holy f**k that was a nightmare.' That's where the name came from. It fit me, and it fit me well. When I enter that squared circle on April 6, Johnny Bedford is going to be in for a rude awakening from the 'Nightmare.' This is going to be a nightmare he won't soon forget." Win, lose, or draw on April 6, Velazquez seems content with sticking with the sport of bare knuckle boxing, at least for now. "I've been doing MMA for the past six years or so and this opportunity to fight and compete in bare knuckle boxing kind of just fell in my hands," he said. "When you are in a new sport like bare knuckle, it feels like you are starting over," Velazquez said. "It's a fresh start. It is like having your first pro fight. You get in the ring, you get amped up, your adrenaline kicks in. It is like doing your first cage fight. It is a unique feeling. "I would like to stay with Bare Knuckle FC. They treat me well. I am not done with MMA though. I like to keep my options open. I would like to do boxing, like to do Muay Thai. I want to try and get more fights in, get different looks, different training. I'll do bare knuckle, I'll do MMA. I'm going to get into boxing this year. There's going to be a lot going on this year." A lot of time and preparation are put into a fight as a competitor can spend weeks, sometimes even months, training, dieting, and running through a fight camp, getting ready for the man or woman standing opposite them in the cage or ring. It only took Velazquez 76-seconds to finish West, but he knows not every fight will be the same. "My training is totally different. We are mainly concentrating on my standup and working the hands. It's bare knuckle, there's no Jiu Jitsu or anything like that. We're working little bit of MMA and clinching, like Muay Thai but yeah, I'm working on letting these hands go. "I'm a normal guy. I work a day job. I do landscaping during the day, a 7-5, and then I jump right into training. Right now I've also been gong to Tampa a few days a week, working on my boxing. It's been a great a fight camp." Whether or not Velazquez is prepared enough for the likes of Johnny Bedford remains to be seen. Bare Knuckle FC 5 takes place at the Mississippi Coast Coliseum.